Does America have a concentration problem? On March 27-29, the Stigler Center will host a first-of-its-kind, three-day conference in Chicago that will focus on this very question. The conference will bring together dozens of top academics from law, economics, history, and political science, policymakers, journalists, and public intellectuals, including two keynote speakers: Margrethe Vestager, the European Commissioner for Competition, and Judge Richard A. Posner of the U.S. Court of Appeals for the 7th Circuit in Chicago and the University of Chicago Law School. Ahead of this conference, we decided to present influential scholars and intellectuals with some questions on concentration, market power, and bigness—and their potential effects on the U.S. economy. You can find previous installments here. F. M. Scherer is the Aetna Professor Emeritus in the John F. Kennedy School of Government at Harvard University. From 1974 to 1976, he was chief economist at the Federal Trade Commission. Since 1963, the year he received his Ph.D. in business economics from Harvard University, Scherer has authored numerous publications and books on industrial economics and the economics of technological change, including the forthcoming Monopoly, Mergers, and Competition Policy, which will be published in May. 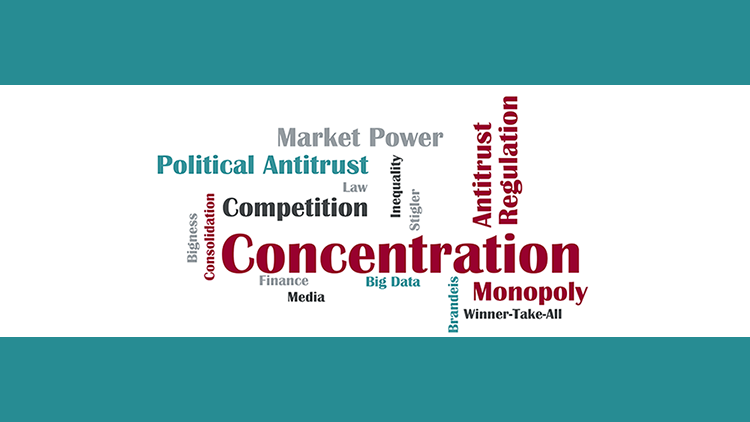 In an interview with ProMarket, Scherer answered questions about concentration, antitrust, and inequality. I have not worked on the data directly for 30 years, except for the banking industry, so I have to rely on published sources for an answer. Before 1990, I personally documented evidence that the shares of assets and value added assets held by largest 100 manufacturing firms was rising. But that’s not the key criterion: leading firms’ shares within individual, well-defined industries are key. I’ve seen second-hand reports from several sources documenting risking shares, and I find them persuasive. But you should query those who have been processing the source data (from the Census Bureau) directly. There appear to be several reasons. Merger activity, always cyclical, has been at peak levels in recent decades. It was predominantly conglomerate during the 1960s and 1970s, but those mergers proved to be efficiency-reducing on average, so it has shifted toward concentration-increasing horizontal mergers in more recent decades. Antitrust efforts to suppress those waves have been insufficient. Also, technological changes have shifted consumer demand toward industries in which patent protection and other aspects of product differentiation sustain relatively high levels of monopoly power, sometimes but not always reflected in bare concentration statistics. Antitrust has also failed to deal with parallel pricing (i.e., conscious parallelism) in such industries. On the other hand (we need President Truman’s one-armed economist! ), increased international trade has been a force restraining monopolistic pricing, but not fully. Q: Which industries should we be concerned with when we look at questions of concentration? Do we have evidence of excessive market power, reduction in quality or investment, or growing political influence? There are so many, it’s hard to single out particular industries. If I had to, I would emphasize banking, pharmaceuticals, broadband information transmission, and several of the so-called information technology industries. Absolutely. Let me provide an anecdote for my answer. Back in 2012, I obtained data on the concentration of activity in narrowly-defined segments of the banking industry. I opined in reviewing the statistics that many fields were ripe for outright collusion. Sure enough, since then, important conspiracies have been detected in several fields, e.g., LIBOR rate-setting, currency exchange rate setting, crude oil futures, aluminum futures, and bidding on new private equity acquisition deals. Our efforts to deal with the problems in the United States have been an abject failure. I refer in particular to the failed efforts against Microsoft and Intel, in both of which I played some active role. The European Community antitrust agency has been more successful, at least in the largely completed Microsoft and Intel cases. The success of its efforts with respect to Google remains to be seen. I believe the Commission has also acted against Amazon’s use of low-tax nations as billing addresses for shipments in Europe to higher-tax jurisdictions, although I’m not sure how successful. I might note that Facebook’s dominant position in the market is due in part to its role as an innovator and partly to “network externalities”—that is, the service is more valuable to potential customer I if customers J and K are connected. I know of no antitrust actions with respect to Facebook. I might note that Microsoft’s dominant position is also attributable in part to network externalities—i.e., once its operating system was accepted as a standard, applications program writers had an incentive to tailor their applications to the Microsoft standard. But the antitrust agencies have not taken sufficient measures to remedy abuses of this advantage. I believe there is. The evidence of rising wealth inequality, especially through the work of Piketty and co-authors, is compelling. Less well known is evidence compiled at M.I.T. of strongly rising inequality of compensation, especially at the top executive levels. The nexus has not to my knowledge been fully articulated. Here’s my hypothesis: In recent decades, most publicly-traded corporations, at least in the United States, have embraced executive compensation consultants to advise the board of directors on executive compensation levels. Those consultants provide data on compensation averages and distributions for companies in peer industries. But then the Lake Wobegon effect goes to work. The boards say, “Surely, our guy isn’t below average,” to the average reported by the compensation consultants becomes the minimum standard for compensation. If each top executive receives at least the minimum reported pay and often more, the average rises steadily. Indeed, and here I tread on weaker ground, those compensation costs are built into the costs considered by companies in their product pricing decisions (in a kind of rent-seeking model), and so price levels rise to accommodate rising compensation. I might note that this dynamic applies not only for chief executives, but trickles down to embrace most of companies’ management personnel. I have no idea what President Trump will do. What he has said during the campaign has proved to be an inadequate guide to what he actually does. My guess is that he will weaken the antitrust agencies, but engage in more price “jawboning” than other recent presidents have.